Gurunam Singh, back in Missoula! "Kirtan gives me hope and new eyes to see through. The eyes of my heart and the feelings of my soul." 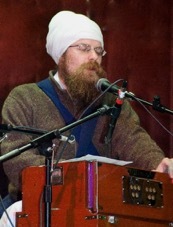 About a year ago I received an email asking if I had any interest in hosting Gurunam Singh for a Kirtan at the studio. I had never heard of him, but Kirtans I had participated in were some of the most fun and energizing 'concerts' I had ever been to. At first I was worried that I wouldn't meet minimums, no one else had heard of him, or it just wouldn't sell out. I was wrong to worry; we had a blast. When I saw he was coming back through Montana I immediately emailed my contact and soon I had a contract in my hands for July 2nd. Join us again for this rocking, mantra filled concert and be prepared to sing along and create beautiful vibrations for Missoula and the world. Listen to his music here, check out his website, or watch him on youtube. 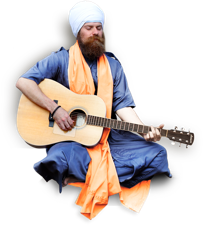 Gurunam Singh tours world-wide sharing his powerful and transformative music. He makes mantra chanting and devotional singing easy, vibrant, and totally accessible. "The music does all the work itself. The power of the mantras. I just get out of the way and then it's my blessing, like everyone else who comes to a kirtan, just to be there, to be part of that energy... to sing,” says Gurunam. His enthralling kirtan sound is a cross-over with influences from folk, rock, pop and country to classical indian raag. His simple devotional songs are sweet listening to sooth the mind and heart. Gurunam’s heartfelt stories and humor bring forth a communion with his audiences. He is also known for his fast chanting style that gets people moving and dancing. Gurunam leads workshops, kirtans, intimate evenings, and benefit (seva) concerts/projects. His artistry, heart and spontaneous energy, elevates the vibration of any gathering. “You can want for other things but when you feel the touch of grace the other wants to fade and you bow inside, wanting and hoping for more of that touch. It comes through yoga, meditation, service, prayer. There are many ways to reach it. Music and chanting are fast as light for the heart and soul," Gurunam explains.